A look into mortgage REITs, and how a vulnerability to interest rates can create dramatic ups and downs. With eye-popping 10% dividend yields, mortgage real estate investment trusts, or mREITs, such as Annaly Capital Management (NYSE:NLY), American Capital Agency (NASDAQ:AGNC), and ARMOUR Residential REIT (NYSE:ARR), offer a tempting proposition. However, because these companies have a volatile history of ups and downs, they could prove dangerous for retirees working with a shorter investing horizon. There are number of reasons for this rocky history, but I'll focus on one important aspect of the mREIT business model that leaves these companies vulnerable to interest rates. What causes the ups and downs? As finance companies, mREITs share some similarities with traditional banks. For instance, banks collect customer deposits and then use that money to make loans. In a similar fashion, mREITs borrow money and then buy mortgage-backed securities -- pools of residential mortgages packaged into fixed-income securities. 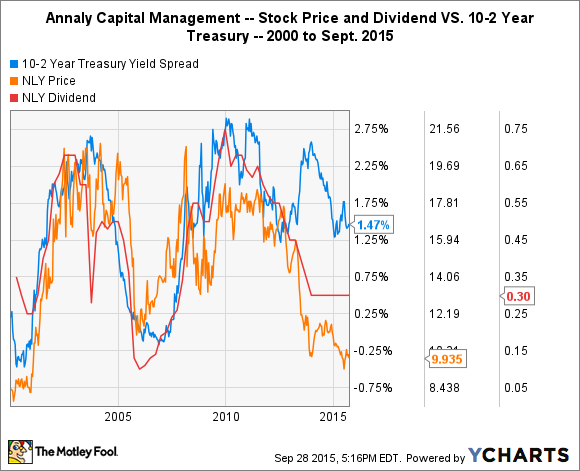 In both cases the companies are earning the spread, or difference, between what it costs to borrow and the yield on assets. The big advantage for banks, however, is that customer deposits represent a reliable source of low-cost funding, which not available to mREITs. Instead, mREITs use repurchase agreements, or REPO loans, which allows them to use collateral to make short-term borrowings based on market rates. Ultimately, mREITs have two big variables: the yield on the securities they buy and the interest rate they pay to borrow. Most importantly, these rates don't always move in unison; rather, they will spread apart and narrow over time. 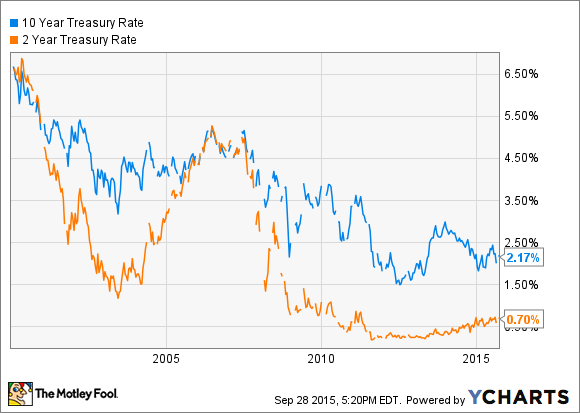 The following chart shows the difference in yield between the 10- and two-year Treasury rate, which has traditionally matched up well with the spread mREITs earn. When the spread is nice and wide, as in 2010, Annaly and its peers can borrow cheaply and earn a higher yield on their securities. However, when the opposite is true, as in 2007, investors start to see dramatically falling stock prices and dividend cuts. Don't take my word for it. The following chart is the same as the previous one, with Annaly's dividend and stock price per share laid on top. As spreads widen out, the way they did from 2008 to 2010, Annaly is able to generate better returns, and we see their dividend and stock price rise. The concern is that as these spreads tighten, as they did from 2005 to 2007, we see some pretty dramatic drops in stock price and dividends. Although, the chart shows only Annaly, but ARMOUR Residential and American Capital Agency are investing in the same assets with a similar method, so the results tend to follow closely. There's an old saying about how past performance doesn't guarantee future results, but I think there's good reason to believe this trend will continue to happen -- and to prove it I'll have to break out one more chart. 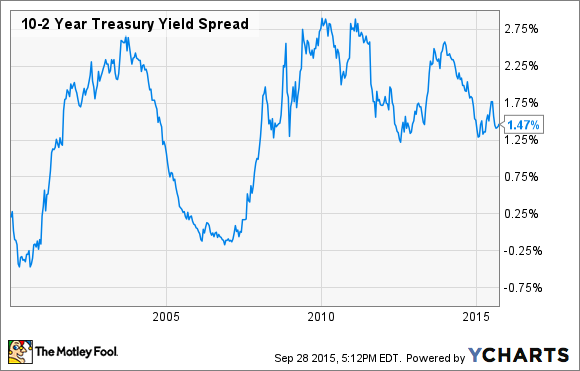 Logically, 10-year Treasury bonds should always yield more than two-year bonds, but a quick glance at 2001 and 2007 in the chart shows that isn't always the case. The reason something like this can happen is that long- and short-term rates are controlled by different forces with different goals. For instance, the Federal Reserve more or less controls short-term rates. In fact, this is something we're seeing play out right now, as the Fed lowered rates to stimulate the economy following the financial crisis in 2009 and is now working toward an increase. On the other hand, longer-term rates are market driven -- more heavily influenced by supply and demand. The end result is the the Fed is looking out for the economy, and investors are looking out for themselves, which can create some interesting results. So, over time, long- and short-term interest rates will come together and spread apart, and this trend will, at times, make life challenging for mREITs as well as create opportunity. The good news for mREITs is that interest rates tend to work themselves out over time. However, in shorter stints, the mREIT business model is vulnerable to fairly dramatic price declines, which means that retired investors looking for a smoother ride, or people who have a shorter-term investing horizon, you may want to avoid these investments.